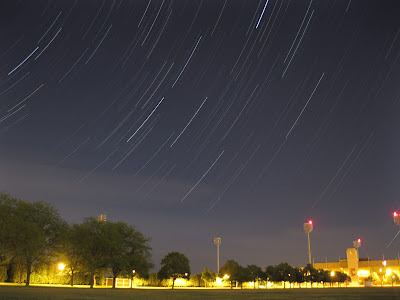 Check out my latest star trail image, this time with more interesting foreground. I made this using a stack of 81 photos from May 5, 2012 between midnight at 1am at the intramural fields overlooking the stadium at Bowling Green State University. 15 sec exposure each at ISO 400. Facing northeast, the brightest star leaving the top of the frame is Vega.